Three years removed from Black Narcissus, but no less libidinal, Gone to Earth finds The Archers further plumbing the depths of repressed sexuality, exchanging religious vows for the jejune fumblings of adolescence. Where Narcissus considered the internal struggle between orientation and obligation, Gone examines the external influence of male desire on female maturation, specifically the preceding pursuit and subsequent ensnarement of betrothal. Though the subtext and sweep of conflicting emotions bear the benchmarks of high drama, the execution exhibits nuance and serenity, trading the promise of Heaven for the terrestrial pleasures of a rapturous embrace and the sublime shadow cast by setting cerulean skies. Guided by this tussle between the temporal and spiritual, Hazel Woodus (Jennifer Jones) acts as a creature of contrast, her virginal modesty concealing a bohemian sense of wonder and motherly devotion. At the heart of her naive superstition and philotherianism is a detachment from both town and country, expressed by barefoot frolicing and the willful disruption of the foxhunt, each antisocial measure lionized by the camera’s tender, close-up gaze and derided by Shropshire’s old guard. Though her tongue is as rough-hewn as her garments, a ripening sensuality peeks out from beneath the juvenile exterior, drawing the ire of aging locals and the lustful eye of a cunning horseman (David Farrar), who exploits her credulity in the name of sexual conquest. Caught between torrential rainfall and the might of the horseman’s grasp, Hazel wrestles between her virtue and the beckoning of womanhood, forfeiting chastity to the tenderness of his lips, much like the crimson fox succumbs to the fangs of the virile hound. 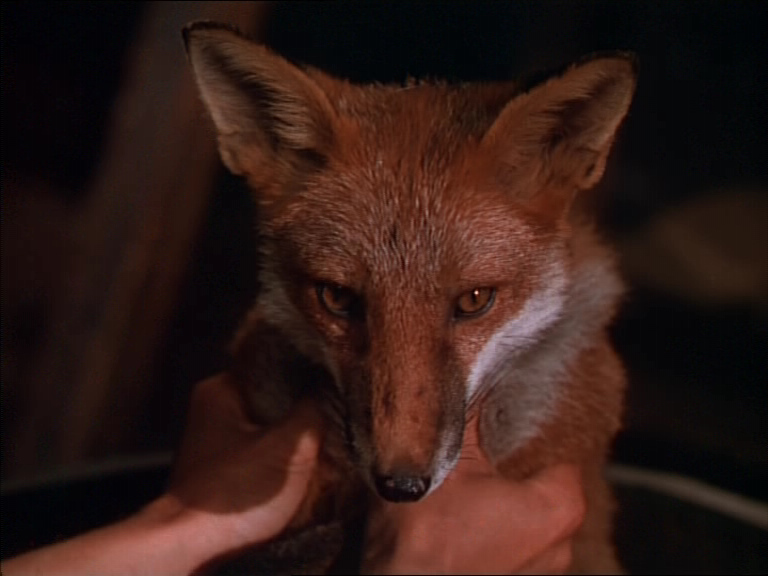 This carnal metaphor shared between Hazel and the docile Reynard is evoked by a duo of muted, rhyming images, filmed from above at a protective distance, delicately illuminating purity in the face of danger and corruption. Though the soft pastel hue of each portrait suggests a starry-eyed, masculine sentimentality for maidenhood, the camera never sneers at or pities its subjects, it simply exalts their incorruptibility and lack of experience. Our brazen hunter and the meek town parson are as captivated by the notion of an immaculate, and ultimately unattainable, ingénue as the camera, though the pious Edward Marston (Cyril Cusack) primarily seeks a reflection of his own sanctimony over a partner for an intimate tryst. Hearing the cherubic pitch of Hazel’s voice and spying the hypnotic sway of her xanthous Sunday gown, Marston proposes marriage as an extension of his ecclesiastical vows, stowing her away for safekeeping and domesticating her to a life of Christian practicality and celibacy. The structure of wedlock provides her with comfort, but lacks catharsis, and her feral nature and penchant for defiance lure her back into the clutches of the trailing huntsman, who shadows her every move like a maleficent phantasm. Photographed before the cautionary yellow of the setting sun and at a craven kneel, his towering figure is given a framing as resonant as any in The Searchers, observed at a distance and bordered by red drapery, shot to symbolically restrict him from penetrating her inhibitive homestead. Yet, abstinence cannot sate biological necessity and the passionate consummation shared by Hazel and the foxhunter commences with the brute force of a stomped boot. As the heel of his shoe smothers her bouquet of red flowers into the dusty earth, the viewer is impelled to accept Hazel as an autonomous adult over an idealized vision of a virginal Madonna. Edward ultimately shares this realization as he examines her womanly frame enrobed in radiant red, the air of experience exposing the unequitable nature of male projection and embodying the impermanence of youth. It’s a moment of harsh veracity surrounded by illusory beauty, savoring fidelity without sacrificing the swoon of cinematic romance.